* Internal Sidetone Function when used with aviation headsets. * 250 Memory Channels – Includes 150 Programmable Memories plus 100 Book Memory Channels. * Automatic Noise Limiter. Acts to reduce impulse noise from engine ignition systems. * One-Touch Emergency Frequency Access. Just press the [121.5] key for instant operation on the VHF airband emergency frequency. * RX Battery Saver with adjustable save levels. 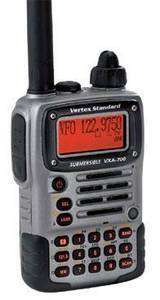 The Vertex Standard VXA-300 is a compact, stylish, solid hand-held transceiver providing communication (transmit and receive) capability on the International Aircraft Communication Band ("COM" band: 118 ~ 136.975 MHz), and it additionally provides VOR and CDI navigation features on the "NAV" band(108 ~ 117.975 MHz). The 150 regular memory channels and 100 preprogrammed "Book"
Alpha-numeric title of up to 8 characters, for easy recognition. For improved reception under difficult conditions, the receiver's audio frequency response may be quickly adjusted by the user, to enhance either the high-frequency or low-frequency components, depending on the noise and/or interference encountered. A Vertex Standard exclusive! Breaking the squelch threshold has never been easier. Press the monitor (MON) button for two seconds to open the Pilot III's squelch continuously. Press MON again to restore the original squelch settings. This is TRUE one- handed operation, without the need to fumble around with tightly spaced concentric knobs. and Business Radio Band in a handheld transceiver! Includes: Li-ion battery pack, wall charger, antenna, quick draw belt clip and headset cable. 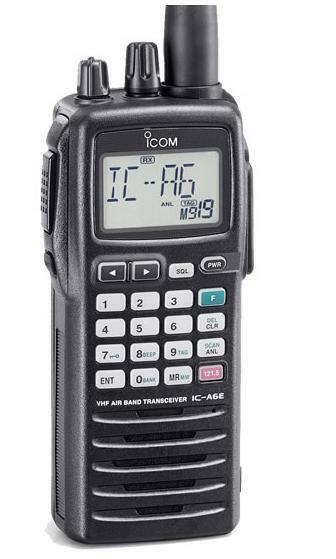 The IC-A6/A24 is the latest from Icom, featuring a large, rubber keypad and easy to read display for one-handed operation in the cockpit. Backlit keypad and display stays on until you turn it off—helpful for night flying. Flip-Flop channel recall function stores the last 10 channels used for instant switching.